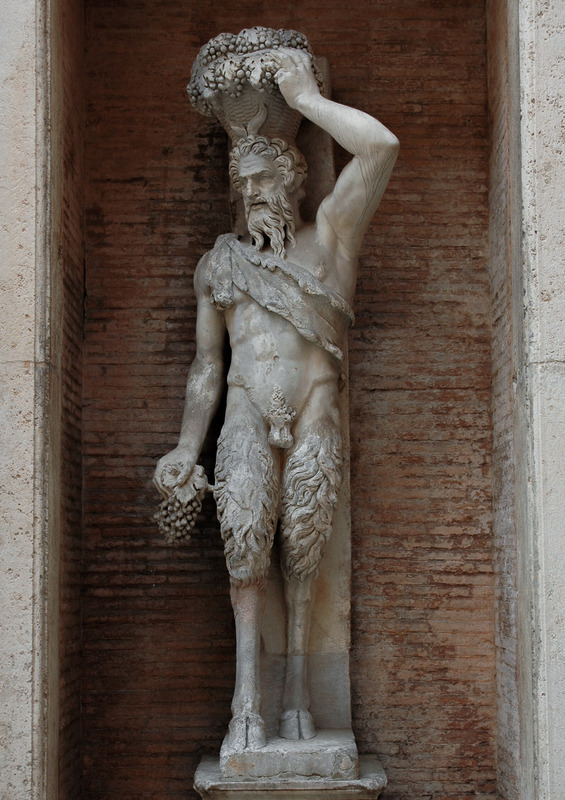 Statue of Pan, “Satyr della Valle”. Marble. After a Hellenistic original. Rome, Capmus Martius, near the Theatre of Pompey. From the Della Valle collection. Two mirror image statues known as the Satyrs “della Valle” (named after the building that originally housed them) are located in niches on either sides of the Marforio. The two statues represent valuable pieces made in the late Hellenistic age depicting Pan, the Greek god of the countryside and nature. They were utilized in the theater of Pompey as telamons, i.e., figures of architectural support. © 2001. Text: The Capitoline Museums. Short guide. Comune di Roma. Electa, 2004, p. 36—37.